A national newsletter for Group Piano Teachers! Published by the Mayron Cole Music Conservatory, Inc.
Muse News® Salutes Two of Our Great All-Star Teachers! 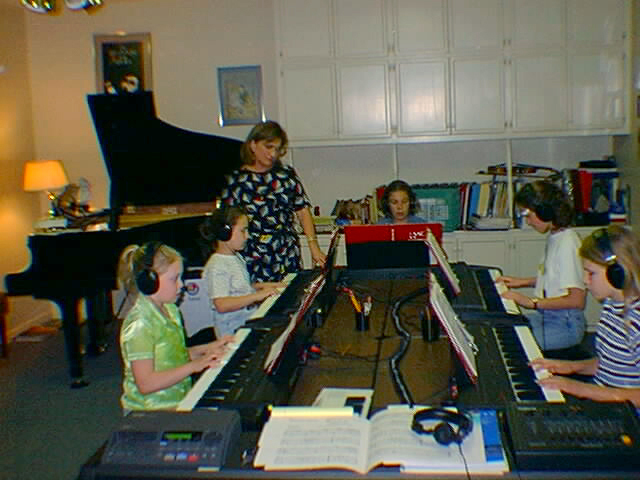 Tanya Ulsh, standing, works with one of her piano classes at her spacious piano studio. Her electronic pianos are sitting on tables that have adjustable-height legs. This type of table provides a very sturdy base and can usually be purchased/ordered at office furniture stores. Thirteen years ago, I owned a piano studio in Corpus Christi, Texas and was teaching forty private lesson students when I read an article in a newsletter that Mayron Cole had written. I remember the article was entitled Is Group Piano Teaching For You? How do You Get Started? A footnote at the end of the article announced that Mayron would be at the upcoming state piano teachers convention and would talk about group piano teaching. At that time, I was at the end of my rope from teaching almost every waking hour, and I was frustrated that I was never able to spend enough time with my five children. I knew that I either had to go into group piano teaching or hire another teacher to give me some help in my studio. So, off I went to the state convention to hear Mayron. I came back to Corpus Christi determined to put all of my private lesson students into group piano classes. That was a big error in judgment, I know now, because privately trained students do not do well in group piano classes. (Anne Haackeys Steps to Learning.) Some of my old students quit because they couldnt make the adjustment into group piano classes. But I kept going. I had purchased four keyboards, and I wasnt going to quit for any reason. A year later, my group piano studio was doing well, I had gained confidence, and class enrollment had climbed to around fifty students when I decided to move to a small city in central Texas that I had always loved. Mayron volunteered to write an article about me for my new hometowns newspaper announcing my arrival in town and the opening of my new group piano studio. I also had a flier printed and inserted into the newspaper the day the article ran. That article and flier had students pouring into my studio! And most were beginners which meant they could be taught well from the beginning. By Thanksgiving I had sixty-five students, and for the past twelve years, my studio has been filled almost to capacity! I truly enjoy teaching Mayrons piano method. I have had the pleasure to teach many students to read music well, and Ive helped give them a life-long love of playing the piano. And thats a rewarding feeling! Plus, having such a well-written program to use in my studio has made my job of teaching a lot easier. And I have fun teaching! The classes are fast-paced and the time just flies by. And from a financial standpoint, teaching piano in groups has enabled me to obtain an income that a professional would be proud to earn because this year I have seventy-eight students. And I teach all seventy-eight students in four afternoons! Ive come a long way from the first year that I tried group piano teaching, and Ive learned a lot! Ive learned that transfer students must be privately taught in Mayrons piano method until they have obtained all the knowledge that my group taught students have mastered. After the transfer student has completed remedial work in Mayrons piano method, I place her/him in a suitable piano class. I currently have four transfer students with whom I am working. Its slow, but thats the only way I can accept transfer students and have them become successful piano class members. And my piano class students are successful! They are all independent musiciansable to read notes and count rhythms accurately! Im very proud of that! Its enjoyable to look back over my career as a group piano teacher. I feel good about my teaching! And, this year I have a senior student who has been with me since I moved to this town twelve years ago. She started in Mayrons Menhune Music and is now in Level 7-B. She has been trained only with group piano lessons. She works for me as a substitute teacher, and she plans to minor in music when she goes to college next year. As you can see, its been a good thirteen years with The Mayron Cole Piano Method. Read about our other Great All-Star Teacher!